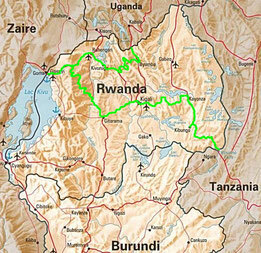 577 km of cycling - as part of a bicycle world trip - from the border with Uganda past the Virunga Volcanos with the last remaining mountain gorillas to Gisenyi at Lake Kivu at the Congo border, on bumpy mountain dirt roads across Rwanda to the capital Kigali and further southeast to the Tanzanian border. Do you like Cycling Rwanda? After seemingly endless negotiating with a crowd of moneychangers surrounding me and skillfully trying to cheat me, I eventually got changed our remaining Ugandan shilling to Rwandan francs. So we finally got started towards Byumba, rather unusually on the wrong side of the road, the road's right lane. On small and dusty dirt tracks we crossed the mountains to Ruhengeri close to the imposing Virunga Volcanos, home to the last remaining mountain gorillas. Since the movie "Instinct" with Anthony Hopkins, as I would say one of the best movies ever, the Virunga Volcanos had been one of those magical places on earth on that I had pointed my finger on the world map. But a visit to the mountain gorillas cost the hefty fee of 500 US dollar and was (fortunately) limited to just a small number of people once a day. Due to this, permits were not easy to obtain and they were often booked out months in advance. Therefore unfortunately, or, regarding the gorillas, better said fortunately, no chance for us. So we kept on going across the mountains to Gisenyi at Lake Kivu close to the Congo border. 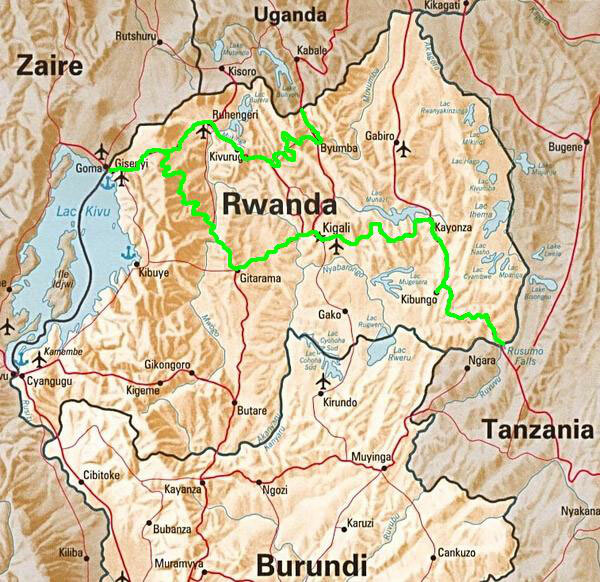 We would have loved to make a detour to Congo, but for security reasons we didn't. Only recently again two foreigners had been shot not far from here: a tourist and a doctor from "Doctors Without Borders". The beach at Gisenyi had been quite nice, but it was raining and it got cold. Nevertheless Hugo bizarrely preferred to stay a day longer and to do the only thing one can do here: staying the whole day in bed. So I started alone. Having crossed back over the pass heavy rainfall began and I head south for Gitarama. But after a couple of kilometres the supposedly paved road became a steeply up and down winding muddy dirt track which in the constant rainfall appeared to be rather a riverbed than a road and which more and more deteriorated to a small track, just passable for 4WD. Furthermore it climbed steeply over 2,000 m above sea level and due to this it became not just wet but particularly cold as well. It had been hard to find a place to pitch the tent and as I mostly had to push the bike the chance to reach the next big village was more than little. I asked a couple of locals for a possibility to stay overnight, hoping they would provide any kind of a dry place to sleep. After seemingly endless forth and back they accompanied me in ongoing heavy and constant rainfall away from the muddy track, which they called "main highway", deeper and deeper into the rolling mountains to a tiny village and the nearby Catholic church. And what happened now, can probably just someone fully appreciate who once stood with his bicycle in the middle of nowhere, in heavily pouring rain and cold, exhausted and without the slightest down-to-earth chance of getting a place to sleep: Father Bernard gave me a huge room with attached bathroom and brought a full bucket of hot water for shower. We had a hot tea and a chat together, before going for a three-course-dinner with red wine. Next morning we met for breakfast with hot tea, fruits and a huge cheese. I think, even Father Bernard could hardly imagine how deeply thankful I had actually been for his tremendous hospitality. Yep, and chicken Hugo apparently got remorse and took a bus to Rwanda's capital Kigali, where I eventually arrived after two more days of cycling through the mountains and rolling hills. Not only here we got aware of Rwanda's past: 14 years ago one of the United Nation's most terrible failings gave way to the so called "final solution" to the Tutsi-"problem", their extermination. Having lived together in peace for decades, the white man wrongly declared them as different races with different intellects and provided them with passports showing their "race". The directed killing of 10 Belgian UN peacekeepers prompted precisely what had been calculated: with sizes of troops that would have been sufficient to prevent the genocide, Belgium withdrew all aid workers, diplomats and remaining UN peacekeepers. Over three months the world watched the systematic slaughter of every day thousands of Tutsi and Hutu suspected of sympathising with them. The most shocking part was the enthusiasm with which even women and children joined in the carnage. Up to a million (!) people were being shot, butchered with machetes or even simply tortured to death. The streets on which we cycled were littered with dismembered corpses and blood only 14 years ago.